Laurel trees are a unique specimen. 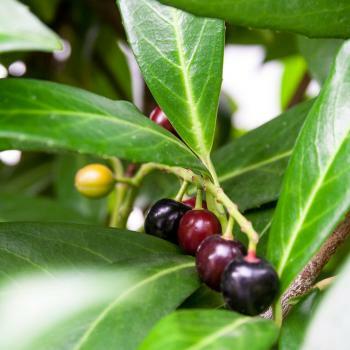 Unlike some species, not all trees that share the name "Laurel" belong to the same family. English Laurel, often referred to as Cherry Laurel, is a large evergreen shrub or small tree. The tree is popular with homeowners looking for attractive foliage to use as a hedge or driveway border. 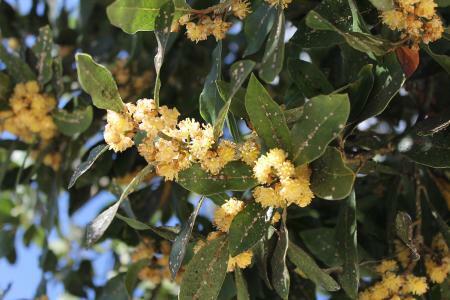 It belongs to the genus Prunus and is not related to the true Laurel which belongs to the genus Laurus nobilis. English Laurel gets its name from its resemblance to the true Laurel tree, but it is actually related to the cherry tree family. The bushy-looking tree can grow up to 30 feet tall and sport an even wider canopy of leaves. Leaves: The tree's shiny oblong leaves range from three to six inches long. The topsides of the leaves are leathery and dark green while the undersides are light green. 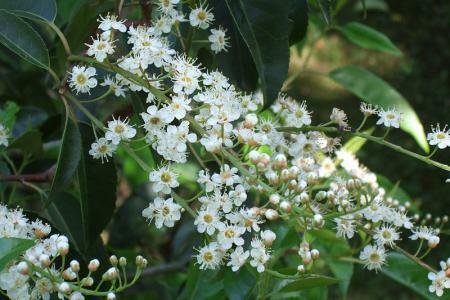 Flowers: In late spring the English Laurel is covered with fragrant, white cup-shaped flowers. Fruit: Tiny half-inch long cherry-like fruits form on the tree in clusters. The fruit's color ranges from dark purple to black. The dense tree is fast-growing and can rapidly reach 20 feet if it is not pruned regularly. 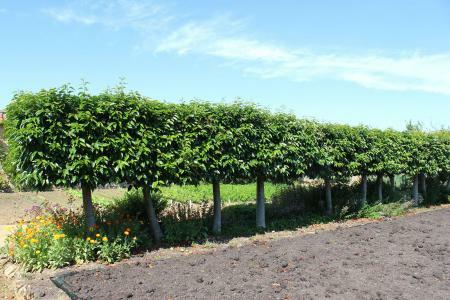 Prunus Schipkaensis: This columnar plant grows to 10 feet and is typically referred to as the "Dwarf Laurel." 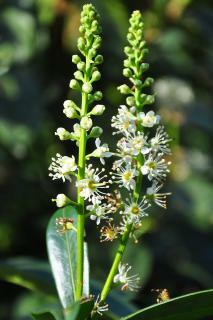 Prunus Caroliniana: Also known as the Poisonous Cherry Laurel, the tree's leaves and branches contain cyanide. Since this type of Prunus contains poison, it is not recommended that you plant the tree near children's play areas. Prunus Lusitanica: Better known as "Portuguese Laurel," it is a small poison-free tree whose leaves have a red tint. 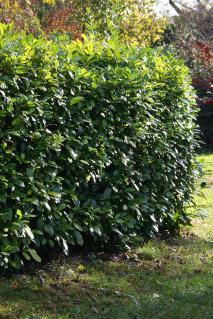 The tree makes for an ideal hedge as it responds well to pruning. 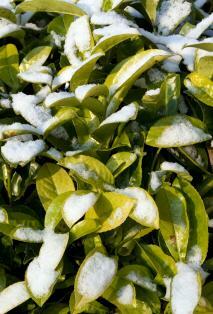 Most types of Prunus are very hardy and can withstand below freezing temperatures. The English Laurel is native to southwestern Asia and southeastern Europe; however, over time the tree has expanded to North America and other parts of the world, including Iran. In the United States, the species is especially prevalent in the Pacific Northwest, specifically Washington, Oregon, and northern California. While the tree is tolerant of shade, it is vital that it is placed in an area that experiences full sun for at least part of the day, especially in colder climates. 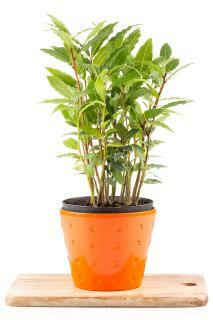 In addition, the English Laurel grows best in slightly acidic soil that is watered regularly. 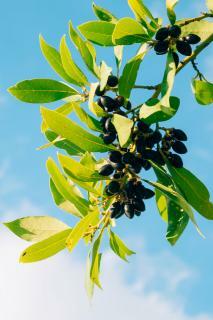 Flavor: Laurel water, which is made from the distillation of the tree's leaves, is often used as an almond flavoring. The English Laurel is especially popular in Europe where it has been grown as an ornamental hedge for more than 400 years. The English Laurel is deeply rooted in history having been around since the 1500s. The original species was discovered by a Swiss researcher who wrote at great length about the intense fragrance of the tree's flowers. To this day, the English Laurel's blossoms are used extensively in floral arrangements, from bridal bouquets to standard corsages. The tree's popularity in the United States was affected in the late 1990s when it was found invading urban parks and forests in and around Seattle, Washington. Due to its hardiness and rapid growth when exposed to cool temperatures and moist soil, Seattle's city administrators were forced to selectively reduce the tree's population in order to avoid the invasive species from overtaking green spaces. Phytophthora ramorum: This fungal infection first appears on the tips of the tree's leaves. The disease creates a yellow outline on the leaf tip before turning the entire leaf brown, black and then gray. As the leaves die, the disease can spread to the tree's branches. Powdery Mildew: This is a common disease among English Laurel. White, powdery spores infect surfaces of the tree's leaves, but can spread to the flowers and fruit. In addition, the fungi can spread from plant to plant very rapidly if not addressed in the early stages. Root Rot: The fungi infect the roots or crowns of the tree and cause the leaves to become discolored and drop prematurely. The tree may also form cankers which ooze black or reddish sap. In addition to these diseases, English Laurels are also the target of pests, including spider mites, aphids, and bark beetles. English Laurel is a landscaper's dream foliage for hedges and other ornamental foliage. However, it can be a homeowner's nightmare if he doesn't have time to prune the tree on a regular basis. 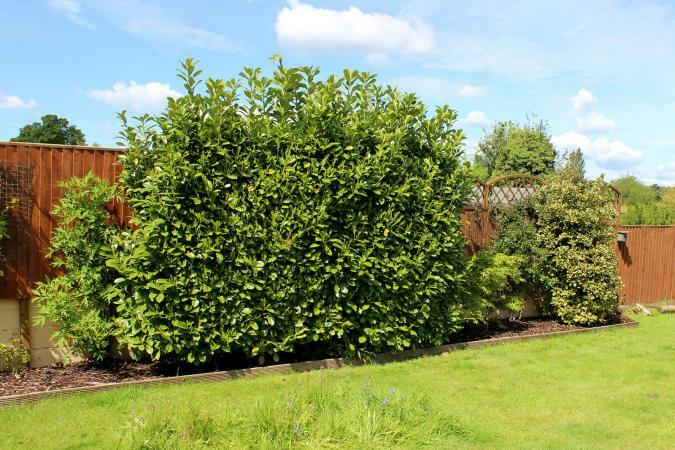 When selecting the English Laurel to add to your property it's important to consider how fast it grows and how often you will have to prune it. Roots: The English Laurel has an extensive root system. 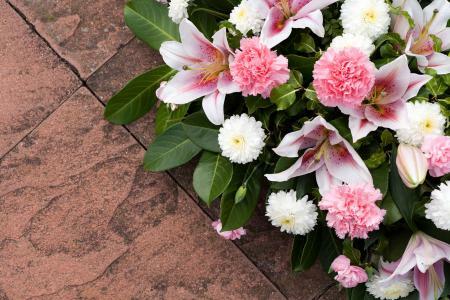 Consequently, it should not be planted near buildings or sewer lines. Ideally, the trees should be planted four feet apart from one another. Watering: The tree grows best in moist, well-drained soil; however, it can die if placed in soil that is watered too frequently. Pruning: To control larger trees, you may need the help of a chainsaw, as the tree's branches are hardy and grow back very quickly. Fertilizer: It isn't really necessary to fertilize Laurel trees to encourage growth. However, if you decide your tree is in need of it, select a slow-release fertilizer made specifically for plants that thrive in acidic soils. You have many choices of the type of laurel tree you grow. 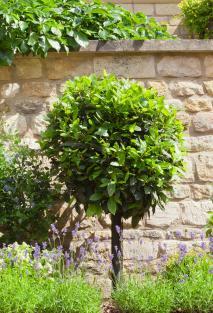 This versatile tree can be used in landscaping for a border, hedge or ornamental foliage.